Please note that some of the intra-operative photographs contained in this glossary are graphic and may be objectionable or disturbing to some viewers. Use discretion when choosing whether or not to view these educational materials. The images are hidden by a warning message until hovered over with the mouse pointer. Commonly called the nostril. The paired crescent-shaped convexities flanking the nasal tip that partially surround the nostril openings. The medial aspect of the ala is supported by the lateral crus of the alar cartilage. No cartilage is present in the outer portion of the ala. 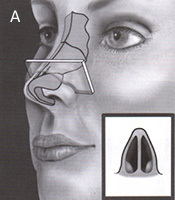 FIGURE 1 Topographic features of the nose; front and profile view. 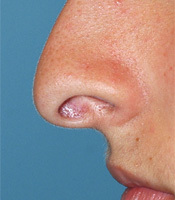 The lower-most portion of the nose. Ideal width of the alar base is approximately equal to the inter-canthal distance (distance between the eyes), but may vary according to personal preference. The ideal alar rim configuration is often described as a “gull wing in flight”. FIGURE 2 Alar base width approximates the inter-canthal space, and the nostrils mimic a “gull wing in flight” (shown in red). Also called the lower lateral cartilages. Paired (mirror image) arches of flexible nasal cartilage which govern the shape and strength of the columella, nasal tip, and alar rims. Each arch is subdivided into the medial crus (columellar segment), intermediate crus (infra-tip segment), dome (lobular segment or tip-defining point), and lateral crus (alar segment). 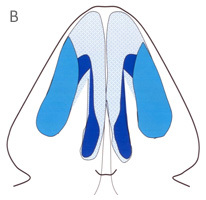 FIGURE 3 Schematic representation of paired alar (tip) cartilages (shown in blue). Profile (A) and base (B) views. Also called notched ala or retracted ala. The cephalic mal-position of the alar rim. A common consequence of over-aggressive cephalic trim of the lateral crura, but may also be congenital. A piece of living tissue (e.g. cartilage, bone, skin, etc. ), harvested from the patient’s own body, for the reconstruction of a body part or appendage. In rhinoplasty, cartilage is commonly harvested from the nasal septum and used to reshape or reinforce the nasal tip or nasal bridge. Ear cartilage or rib cartilage may be used when preferable. Cartilage from each donor site has different physical properties, advantages, and disadvantages. 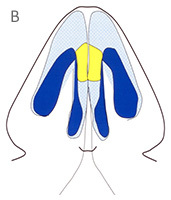 The upper third of the nose (or upper half of the nasal bridge), composed of the paired nasal bones and the bony septum (vertical ethmoid plate). 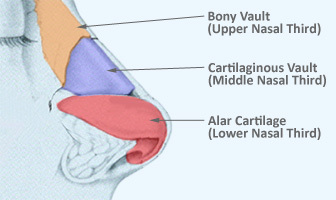 FIGURE 5 Schematic representation of the bony vault (upper nasal third), cartilaginous vault (middle nasal third) and alar cartilage (lower nasal third). A cosmetic nasal deformity characterized by a wide oversized nasal tip with large alar cartilage, often having broad rounded alar domes. 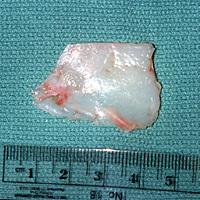 FIGURE 7 The non-essential portion of the cartilaginous septum (approximately one inch wide) harvested for graft fabrication. Note the comparatively small amount of cartilage available from the nose. Synonymous to caudad. 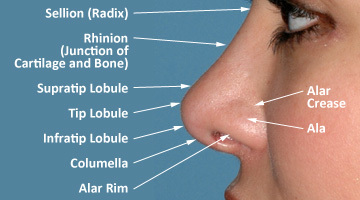 Situated nearer to the nasal base (in nasal anatomy only). The opposite of cephalic or cephalad. A naturally-occurring cosmetic deformity of the nasal base characterized by caudal over-growth of the nasal septum. Hallmark features are a hanging columella, a short upper lip, and webbing of the nasolabial angle. More commonly seen in Mediterranean and Middle-Eastern noses. 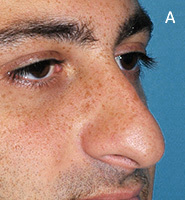 FIGURE 8 Example of a classic caudal excess nasal base deformity before (A) and after (B) rhinoplasty. Note decrease in nasal length and corresponding increase in upper lip length. Synonymous with cephalad (in nasal anatomy only). In a direction toward the head. The opposite of caudal or caudad. Partial excision of the lateral crus along its cephalic border. 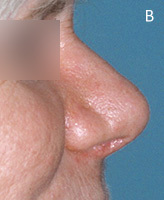 A traditional rhinoplasty technique used in tip narrowing and tip rotation. A common cause of alar retraction and other tip deformities. 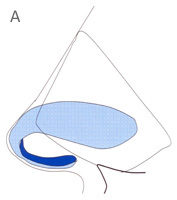 FIGURE 9 Schematic representation of normal alar cartilage (A) and alar cartilage after cephalic trim (B). FIGURE 10 Closed rhinoplasty in which both alar cartilages are being pulled out (“delivered”) through the right nostril for suture modification (i.e., the “delivery” technique). Note the relative concealment of the nasal skeleton, the distortion of the alar cartilages, and the absence of a columellar incision. 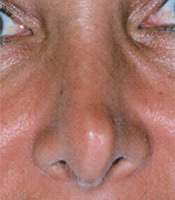 A cosmetic nasal deformity resulting from cocaine abuse and subsequent cocaine-induced tissue necrosis. Hallmark features are a septal perforation, saddle collapse of the middle vault, and progressive deformity. In severe cases, loss of the entire nose and/or fatality may occur. 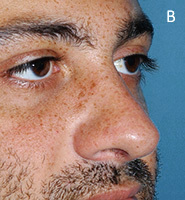 FIGURE 11 Example of advanced cocaine nose deformity before (A) and after (B) surgical reconstruction with rib cartilage. That portion of the columella visible on profile extending beyond the alar rim. Normal columellar show is 2-5 mm. 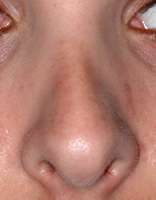 FIGURE 12 Post-operative example of normal columellar show. Note columellar visibility approximately 3 mm beyond the alar rim. A specific type of autologous cartilage graft used to increase tip projection, increase tip rotation, and/or enhance tip support. A concealed graft placed within the columella to stabilize the newly shaped nasal tip cartilage and prevent delayed deformity. 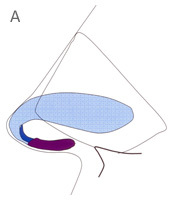 FIGURE 13 Schematic showing position of a columellar strut graft (shown in blue) between the right and left alar cartilages. Pertaining to the nasal dorsum or nasal bridge (in nasal anatomy only). Excessive lymphatic or serous fluid permeation of the soft tissues, typically in response to tissue trauma or disease states. 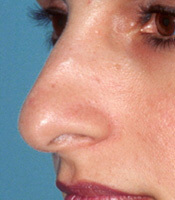 May persist up to 18 months following rhinoplasty in extreme cases. Chronic edema may lead to permanent fibrosis. The formation of fibrous (scar) tissue as a reparative or reactive process in organs or tissues not normally containing fibrous tissue. 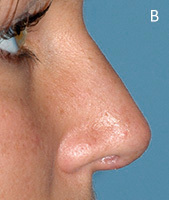 A common sequela in thick-skinned or scar-prone rhinoplasty patients. A cosmetic nasal deformity characterized by an overly-protruding columella, resulting in excessive columellar show on profile view. FIGURE 14 Example of a naturally-occurring “hanging” columella. 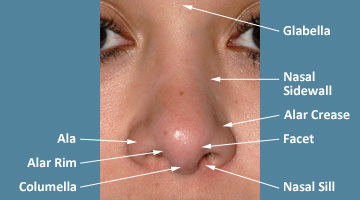 Note excessive nostril visibility from caudal over-growth of the nasal septum. An overactive wound healing response to cutaneous injury or surgery, resulting in an unsightly raised and widened scar. Unlike keloids, a hypertrophic scar usually responds to timely treatment. Situated toward the bottom or below. Situated nearer the soles of the feet in relation to a specified reference point. The opposite of superior. 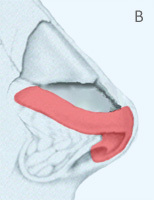 The segment of alar cartilage found above the nostril and below the nasal dome, corresponding to the infra-tip lobule. FIGURE 15 Schematic of the intermediate crura (shown in yellow) from the profile (A) and base (B) views. A modified traditional bone cut positioned midway between the medial and lateral osteotomy cut. Used to reshape misshapen, indented, or cupped nasal bones. 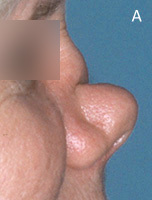 A nasal bridge shadow deformity resulting from excessive narrowing of the middle vault cartilage relative to the adjacent nasal bones. A type of step-off deformity resulting from over-aggressive nasal hump reduction or blunt nasal trauma. A severe overactive wound healing response to cutaneous injury or surgery, resulting in a stubborn tumor-like accumulation of fibrous (scar) tissue. Often difficult or impossible to treat in susceptible individuals. The brand name of triamcinolone acetate, an injectable synthetic steroid used to prevent prolonged edema and unwanted fibrous (scar tissue) formation. Farther from the midline or mid-sagittal plane. Toward the outer perimeter. The opposite of medial. A sub-component of the alar (tip) cartilage. The lateral crus extends obliquely immediately above the alar crease from the nasal dome (medially) to the pyriform aperture/cheek (laterally). 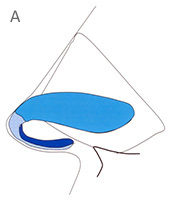 FIGURE 17 Schematic of the lateral crura (shown in turquoise) from the profile (A) and base (B) views. Closer to the midline or mid-saggital plane. Near the middle. The opposite of lateral. The caudal/inferior most segment of the alar cartilage corresponding to the columellar segment. 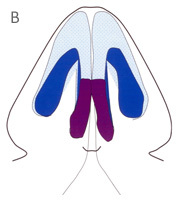 FIGURE 19 Schematic of the medial crura (shown in purple) from the profile (A) and base (B) views. The hinge-point (apex) of each alar cartilage formed by the junction of the intermediate and lateral crus. The tip-defining point. FIGURE 20 Schematic of the nasal domes (shown in red) from the profile (A) and base (B) views. Synonymous with nasal bridge. 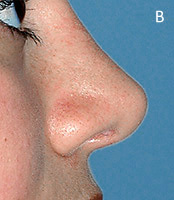 The upper two-thirds of the nose consisting of the middle (cartilaginous) vault and the upper (bony) vault. A non-living, synthetic material used to replace missing or damaged nasal tissues. Although sometimes controversial, nasal implants are still used routinely. 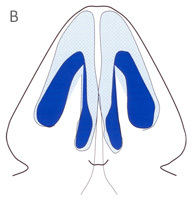 The natural anatomic “bottleneck” of the nasal airway which regulates nasal airflow through alternate swelling and contraction of the septal and turbinate mucosa found on its inner surface. Anatomic obstructions to nasal airflow are most common in the nasal valve area due to its naturally small size. Cosmetic nasal surgery is a common cause of nasal valve dysfunction. 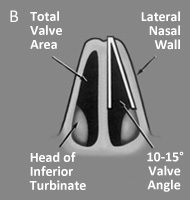 FIGURE 21 Schematic cross-section of the nose taken through the nasal valve area (A) demonstrating the small cross-sectional area and partial obstruction by the inferior turbinate head (B). 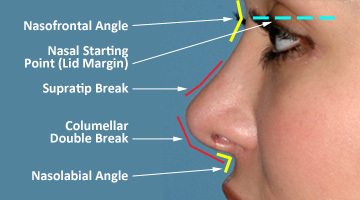 The angle formed between the nasal bridge and the forehead (glabella) as seen on profile view. Ideally the apex (or nasal starting point) is situated at the level of the superior eyelash line. 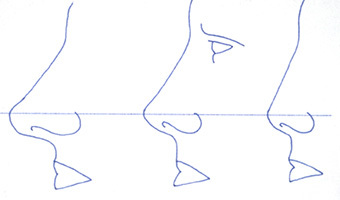 FIGURE 22 Profile aesthetics of the nose. Tissue death resulting from inadequate oxygenation, usually a result of disrupted blood flow. FIGURE 23B Typical skeletal exposure obtained using open rhinoplasty. Note direct visualization of the undistorted nasal framework. FIGURE 23A Incision placement for open rhinoplasty. 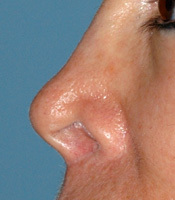 Note the V-shaped trans-columellar incision extending inside the nostril. Gapping of the nasal bones following dorsal hump reduction resulting from over-aggressive hump reduction and/or failure to completely infracture the nasal bones. Also called postage-stamp osteotomy. A type of lateral osteotomy employing a series of side-by-side bone cuts made through a single small skin incision. Thought to be less difficult than the traditional (endonasal) lateral osteotomy, but with the potential for a visible scar. Excessive narrowing of the nasal tip secondary to medial collapse of the alar domes. A frequent consequence of over-aggressive alar cartilage removal and/or over-aggressive tip sutures. FIGURE 24 Example of pinched lobule (tip). Note unsightly vertical flattening of the nasal tip. 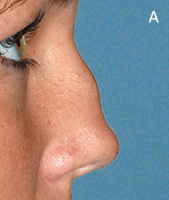 Primary rhinoplasty refers to a previously unoperated nose or first-time rhinoplasty. Primary rhinoplasty is not hindered by previous surgical scarring of the soft tissues or previous surgical damage to the nasal cartilage or bone. A columellar deformity characterized by little or no columellar show, resulting from inadequate columellar projection secondary to over-aggressive cosmetic surgery, nasal trauma, or birth deformity. FIGURE 25 Example of retracted columella with minimal columellar show before (A) and after (B) correction. Term used to describe tip position along a fixed arc of rotation. 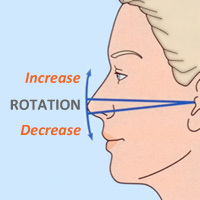 A “rotated tip” rests closer to the forehead and appears perky, whereas a counter-rotated tip is positioned away from the forehead and may appear droopy. Ideal tip rotation varies according to personal preference. FIGURE 26 Schematic representation of tip rotation. A cosmetic and functional nasal deformity resulting from collapse of the middle vault. Causes include autoimmune disease, cocaine abuse, blunt trauma, and over-aggressive cosmetic nasal surgery. FIGURE 27 Example of auto-immune-induced saddle nose deformity before (A) and after (B) rib graft reconstruction. The dividing wall separating the right and left nasal passages, formed by cartilage or bone and covered on both sides with nasal mucosa. 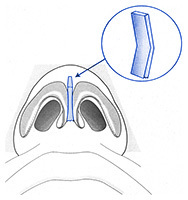 A type of columellar strut graft attached to the caudal septum for maximum support. Commonly used to lengthen short noses. A type of infra-tip cartilage graft fixed to the alar cartilages in order to counter-rotate and/or increase tip projection. 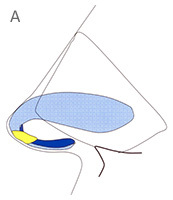 FIGURE 28 Schematic representation of a shield-type augmentation graft (shown in yellow) placed in the infra-tip lobule. A middle vault augmentation graft placed between the dorsal septum and the upper lateral cartilage(s) to increase middle vault width, improve symmetry, increase airway dimension, and/or straighten the dorsal septum. FIGURE 29 Schematic representation of bilateral spreader graft (shown in red). 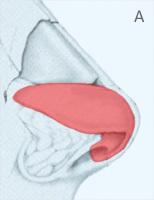 Placement of graft in middle vault straightens curvature of the dorsal septum. A philosophical approach to both cosmetic and functional rhinoplasty, in which nasal framework is artfully reconfigured to enhance beauty, and then structurally reinforced to ensure lasting results. The philosophical opposite to excisional rhinoplasty, a traditional approach in which structural support is compromised, leading to a high probability of progressive deformity. Situated toward the top or above. Situated nearer to the vertex (top of the head). The opposite of inferior. Also called retroussé (pronounced reh-troo-SAY). 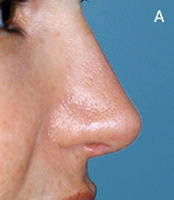 A naturally-occurring variation in height between the nasal tip and the adjacent nasal bridge (as seen on profile). 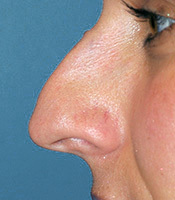 A common topographic feature in feminine noses often sought in cosmetic nasal surgery. The ideal tip retroussé varies according to personal preference and can be modified accordingly. FIGURE 30 Examples of post-operative supra-tip retroussé, ranging from mild (A) to pronounced (B). A naturally-occurring cosmetic deformity characterized by dorsal overgrowth of the nasal septum. Hallmark features include “pollybeak” overgrowth deformity of the nasal bridge, overprojection of the nasal tip, and a wide nasal pedestal. 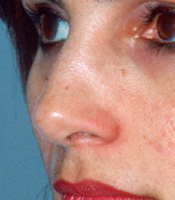 FIGURE 31 Example of a classic tension nose deformity, as seen on profile view. Note overprojected tip and pollybeak deformity (overprojected middle vault). Term used to denote horizontal protrusion of the nose from the vertical plane of the face. FIGURE 32 Schematic representation of tip projection, including over-projected (left), normal (middle), and underprojected (right). A versatile surgical technique used to treat the caudal excess nasal deformity by sewing the medial crura to the caudal septum. FIGURE 33 Example of caudal excess nasal deformity (A), corrected with tongue-in-groove setback procedure (B).